In October of 2012, LA-based photographer Sabine Pearlman found herself ensconced in a Swiss WWII bunker photographing 900 different “specimens” of cross sectioned ammunition. Her resulting photo series, AMMO, shows the beauty and craftsmanship that went into creating these destructive little pieces of engineering. Pearlman “strives to create a poetry of images by synergizing the ‘big picture’ with the small details.” Insofar as her AMMO series is concerned, that means the juxtaposition of beauty and destruction. The cross-sections reveal a hidden complexity and beauty of form, which stands in vast contrast to the destructive purpose of the object. It is a representation of the evil and the beautiful, a reflection of the human condition. Would have been nice if the shells were labeled by caliber and use . some very interesting looking concepts there. thanks for sharing that. Interesting to see how many are boxer versus berdan. Only the place they are stored in is. Some are Vietnam War era & others (eg. blue polymer) are much more recent. seems like they were trying real hard to save money on gun powder. Ok, I give up, how did the middle one work? There is no powder under the primer. the mother of invention aye??? 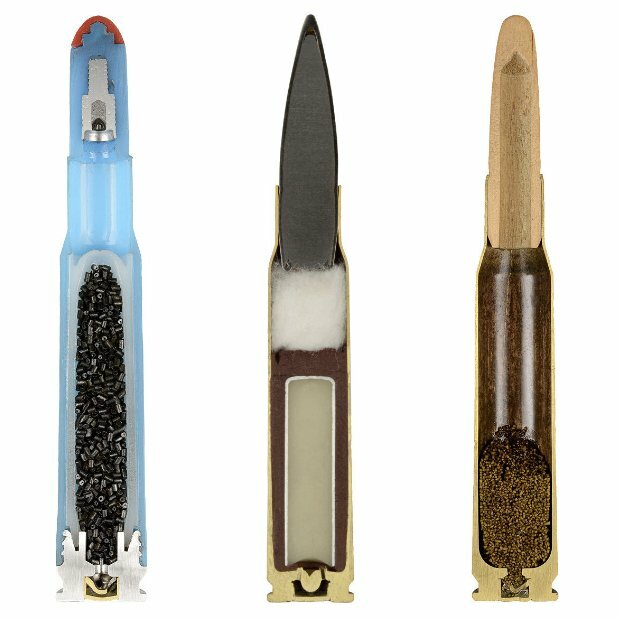 that middle one looks like a great one for a subsonic/smoothbore load..no show of a tumble,the one on the right,they do something similar for the .12ga. Upper left looks like some form of a "caseless" round? It looks to detach at the base and the whole thing goes down the bore. The upper right looks wooden. Very strange some of these! I read an article on at least two of these(many) years ago!The flechette was designed by the germans for an experimental trial round for the nato trials of 5.56mm ammo to be adopted by nato,also I believe the stacked projectile round as well.The flechette was to have a MV over 4kfps(that would induce alot of hydrostatic shock)but the projectile was not that accurate for military purposes.However this particular cartride does not look like 5.56mm,I really don't know whos it is!The stacked round was ok for closer in combat-but did not have the energy needed or the accuracy at longer ranges.I could however imagine that the stacked projectile round would have worked well in door to door combat -when iraq was first stormed! The Flachette is the XM216 Flechette which is 5.6x44mm for the SPIW program. I wonder whats the idea in having powder between the stacked projectiles? To ensure better separation perhaps?